Do Vaccines Cause Autism? It Doesn’t Matter. Vaccinate Anyway. Vaccines have been on the news a lot lately, primarily because people don’t want to be giving their children shots that would result in a neurological disorder (like autism) or something else. Now, while I regard this position as ultimately unsound and not informed on the scientific issue of vaccines as a whole, I believe that even if we grant this fundamental premise of the anti-vax crowd, there is still a very good reason to be pro-vaccine. Put simply, even if vaccines did cause autism, it would still be irresponsible for parents to not vaccinate their children. Vaccines are great at doing what they were intended to do. Namely, prevent certain diseases. 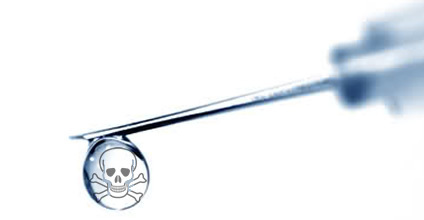 It is virtually impossible to deny that the vaccines do their job. Unless, of course, you think that the scientific community is some kind of conspiracy organization, then you can deny it all you want. But you’d be wrong about vaccines and vaccines would still work. Throw a conspiracy theory at something and you can deny or embrace anything, including decades of research. During the course of our life, we (as humans) take for granted that we know some things about the external world. In fact, we often assume that we know a lot about the external world. We know some things about what happened yesterday, and we certainly know that the yesterday existed. We know that other minds, other than our own exist; we know that tables and chairs exist. We often assume that most knowledge is something that the regular, everyday person can know; it is not specialized for philosophers, historians or scientists. However, there are some things that we simply cannot know. Some future events, for example, are not knowable to us. And if someone claims to know these things, we are justifiably skeptical of that claim. “While almost all of us are skeptical about some knowledge claims, skeptical arguments in philosophy typically purport to show that we do not know or are not justified in believing many of the things we originality assume we know or reasonably believe.” (quote from Lemos, 2007) Many arguments for skepticism conclude that we are unable to know anything about the external world, or that we are not justified in believing anything about the external world. There are a variety of skeptical arguments. One of the more common versions is known as human, external world, knowledge skepticism. 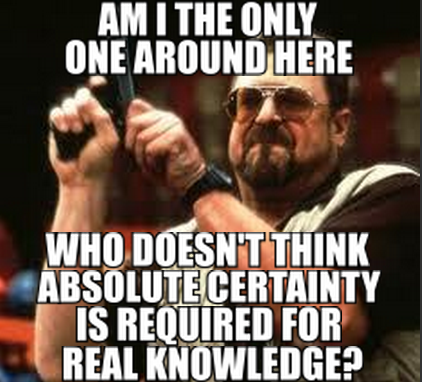 This kind of skepticism denies that people are able to have certain types of knowledge concerning the external world. However, knowledge skepticism does not automatically entail skepticism for justification. It is possible to hold the position that we are justified in believing certain things, but the evidence is not great enough to count as knowledge. Many of the arguments for external world knowledge skepticism come from various skeptical scenarios that epistemologists refer to as bad case scenarios. There are several arguments for human, external world knowledge skepticism, and three of them are (1) the certainty argument, (2) the infallibility argument and (3) the argument from ignorance. One of the most important aspects of a proper understanding of external world knowledge skepticism is a proper understanding of skeptical scenarios. While they come in a variety of different forms, the popular movie, “The Matrix”, is a perfect example of a classic skeptical scenario. In the movie, the characters are all in a computer simulation run by machines, and that the humans are actually connected to a complex network of computers that create what they see as the external world. The humans in the program are deceived into thinking that what they see is real, when in reality, it is nothing more than a computer program. 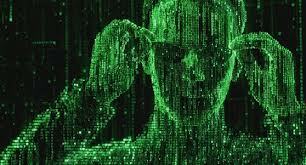 When the main character, Neo, is “awakened” by another person, his real body wakes up out of the computer simulation and he sees the truth for the first time. While “The Matrix” is meant to be a fictional story inspired by a classical skeptical “brain in a vat” scenario, external world knowledge skeptics take these types of situations as not only possible, but actual. But, because of our limitations as human beings, we are unable to truly know anything about the external world. Philosophers refer to these skeptical scenarios as bad case scenarios, where pervasive error reigns. These bad case scenarios are not only philosophical possibilities, but they seem to be something that may, in fact, be reality. And because of this, our proper response should be to suspend judgment on what we actually know about the external world. When we reflect on these examples, it seems clear that our sensory experience does not guarantee that our beliefs about the external world are necessarily true. And initially, that does not really seem to matter. Lots of things are possible, but the real question should be about what is reasonable. Sure, we might be a person in a vat, and our “external world” might be generated by computers. But just asserting the possibility doesn’t give us good reasons to think that we should embrace epistemological skepticism. And that is where philosophers have posited arguments for skepticism. Cancer – What is it Anyway? Many of you have likely encountered a kind of hype that is based almost entirely on the ignorance of the readers. People get a small glimpse into something they [rightfully] see as important, but because they don’t really understand it… they end up drawing erroneous conclusions. Lets face it: many people don’t really understand cancer. Its a difficult disease to understand, and people will often assume that there is some easy cure ‘out there’ and it is being concealed/ignored because cancer research facilities are just in it for the money (or… you know… something like that). The first step in correcting this misconception is to understand what cancer is. With a proper understanding of the complexities of cancer, we can (hopefully) communicate this with people who do not understand it. So while this post may not be as argumentative or provocative as some of my other posts, it is just as (if not more) important. Cancer is the name given to a large group of diseases that behave in a variety of different ways, depending on the type of cell from which they originate. 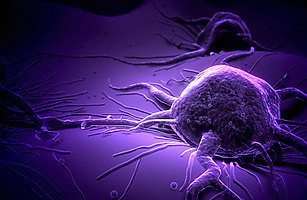 Broadly speaking, cancer is associated with at least two primary symptoms: uncontrolled cell division and metastasis. In normal cells, the cell cycle is a tightly regulated system that is highly controlled and managed by proteins, enzymes and the corresponding genes on the DNA molecule. In some cells, however, the regulations of normal cell processes are interrupted/altered by mutations. These mutations cause many genes to be expressed inappropriately, and this can lead to cancer.